Proven to last up to 1 year, Juvéderm® Ultra XC is a natural cosmetic filler designed to add more fullness and plumpness to thin lips. Juvéderm® was introduced to the market in 2006. It is hyaluronic acid and exists naturally in all living organisms. It is a universal component of the spaces between the cells of the body (extracellular space). Our skin houses the vast majority (56%) of hyaluronic acid, with the remainder found in muscles and bone. A polysaccharide or natural sugar, it has an identical chemical structure in all species and tissue types and is harvested from a variety of sources: plant, animal or non-animal (simple bacteria). Juvéderm® Ultra XC is fully biocompatible, and allergy testing is not required. As we get older, our skin cells lose their ability to produce hyaluronic acid. Additionally, the molecular weight of the hyaluronic acid decreases with age, so that it does not hold water as well as before. Hyaluronic acid is commonly used in moisturizers and cosmetics because of its efficiency at holding on to water. Even while a hyaluronic acid filler is being naturally degraded, what remains of the filler attracts water from the body, and that function allows it to hold its shape even longer and able to maintain its volume until it is almost entirely degraded. Because the body has its own system for absorbing hyaluronic acid, it disappears over time without a trace. Juvéderm is proven to deliver long-lasting results. Studies have shown that Juvéderm effects last for about 6 months. It is a natural cosmetic filler injected into the skin to smooth wrinkles. To help maximize patient comfort, the treatment area is anesthetized with a topical cream or nerve block before injecting Juvéderm. 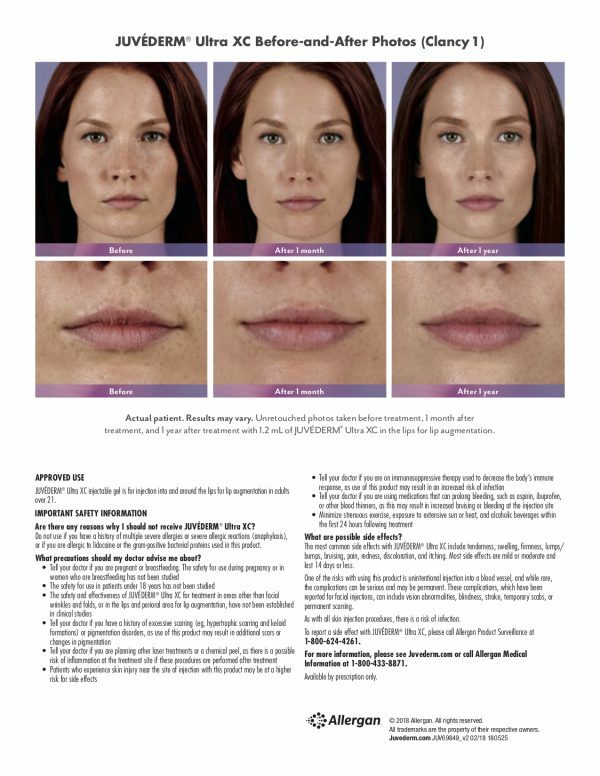 In contrast, Botox® Cosmetic is a drug that relaxes the muscles causing the wrinkles. The most common side effects include redness, swelling, pain, itching, discoloration, bruising, and tenderness.